Since IPv6 first launched on this day six years ago, its deployment has grown steadily around the world, delivering significant performance, speed, and other technical benefits over its predecessor, IPv4. Even more important, the world is out of IPv4 addresses, and the entire industry needs to migrate to IPv6 to allow for the continued growth of the internet. 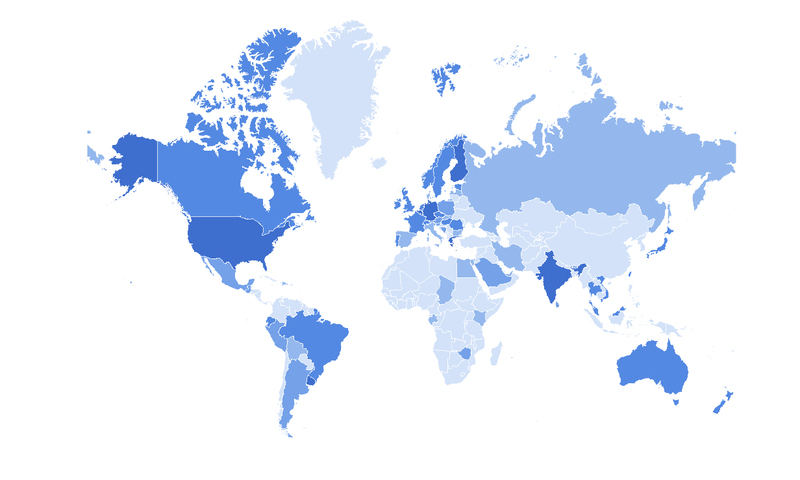 To better understand our own IPv6 traffic, we have been measuring IPv6 adoption rate around the world, and we are happy to announce that we are sharing this information at facebook.com/ipv6. We’ve seen encouraging trends in the U.S., as well as promising growth around the world. The switch to IPv6 accelerated after IPv4 ran out of available addresses in 2015, and the trend has continued and in some cases sped up even more since then. We presented some of our findings at our Networking @Scale conference on May 22, 2018, and are sharing highlights here. We hope those involved in improving internet services will find this information useful and work with Facebook and others to help drive IPv6 adoption even higher. Facebook’s IPv6 traffic in the United States crossed the 50 percent milestone over Memorial Day weekend 2018. The adoption rate jumped recently after we adjusted our implementation of an Internet Engineering Task Force algorithm that improves application responsiveness by connecting simultaneously to both IPv4 and IPv6. (More details about the algorithm, called Happy Eyeballs, are available in RFC 6555 and RFC 8305.) People using Facebook services typically see better performance over IPv6, but the radio inside many devices requires about 50 ms to warm up. By increasing the timeout from 50 ms to 150 ms, we were able to make sure those devices didn’t fall back to IPv4 unnecessarily, and we could keep more people on IPv6 and provide a better experience. IPv6 has become the dominant protocol for all major U.S. mobile carriers, which now direct more than 75 percent of their Facebook traffic through IPv6 protocol. U.S. mobile carriers have done an impressive job moving to IPv6. All major mobile carriers have topped 50% deployment and some much more. For example, T-Mobile now routes more than 90% of traffic through the IPv6 protocol, and is working aggressively to reach 100%, due in part to its decision to upgrade older devices to IPv6. Cable and fiber companies are also making the transition to IPv6. Comcast, one of the largest ISPs in the U.S., with over 25 million subscribers, has reached 75 percent IPv6 deployment on weekends in recent weeks. (IPv6 usage typically peaks on weekends, when there is less corporate traffic.) We’ve been very encouraged by the efforts of both ISPs and mobile carriers to move to IPv6, and we hope more companies follow suit. We are also seeing countries and regions with less mature internet infrastructure start to transition to IPv6. Although overall deployment is still low, recent growth in some places has been exponential. Taiwan, for example, has gone from less than 1 percent in February 2018 to more than 10 percent as of May 28, 2018. Taiwan’s rapid growth directly corresponds to recent IPv6 initiatives by Chunghwa, Taiwan’s largest ISP. We have also seen promising growth in many other countries. India crossed the 50 percent milestone last weekend, becoming the second country to do so among top 10 countries ranked by IPv6 traffic volume. Mexico has doubled their IPv6 rate from 3.32 percent to more than 7 percent since February 2018. Vietnam went from 8.5 percent to more than 13 percent in the same period of time. Thailand saw a substantial increase as well, going from below 15.68 percent in February 2018 to almost 20 percent as of June 2018. We are really excited to see the progress in deployment since it indicates increasing awareness of the benefits of IPv6. We want to share this excitement with the public by disclosing all relevant information on facebook.com/ipv6. We hope more ISPs and countries will join the effort and make the transition to IPv6 soon. Many thanks to James Zeng, Jim Tian, Shiguang Wang and Qizhen Ruan who helped make this page possible.